Every fall, I make these almost weekly. They are good with a variety of add-ins: dried cranberries, raisins, pumpkin seeds, or walnuts are my usual favorites. The smell of these baking on a dreary, wet morning somehow makes everything seem warm and cozy. Top them with cream cheese for extra decadence! Preheat oven to 350 F. Mix together dry ingredients. Mix wet ingredients and add to dry. Stir in nuts/dried fruit. 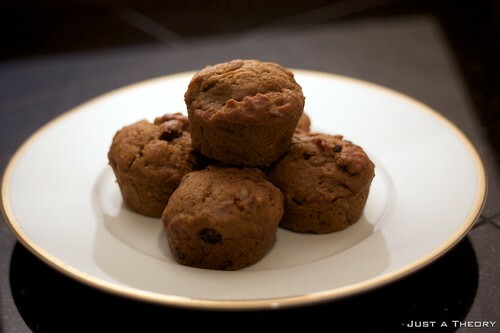 Place batter in greased muffin tin or loaf pan and bake until done (about 20-25 minutes for muffins; 1 hour for loaf). You want it to feel springy to the touch. This freezes well, but you won't have any leftover!